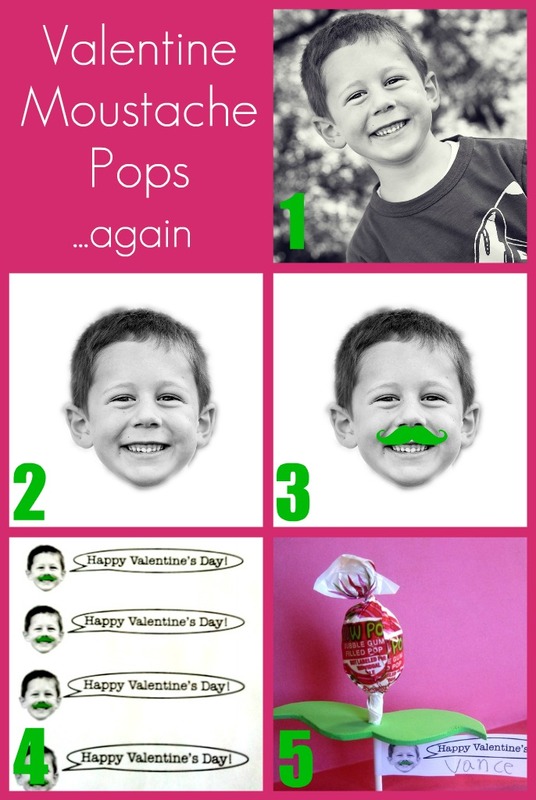 We all know that I'm a sucker for a fake moustache, so when Vance requested these (again) for his Valentines I was more than happy. I figure a new school means a new audience, plus I already have the photoshopping done. I broke it down into steps this time around, so here we go. Step 2: I used Photoshop to "cut" his head from the picture but any photo editing site will work. Old school works here too - print the picture, cut around it with scissors, then scan it or even take another picture of it against a white piece of paper. Either way your goal is a floating head type of appearance. Step 3: Slap a moustache on it. Again, there's a ton of free photo editing sites out there. If not you could cut a teeny one from paper, glue it on, and scan it back in. Or draw one one. It's a Valentine for kids. They won't care if it's a little wonky. Step 4: I copy and pasted his head along with a speech bubble that said, "Happy Valentine's Day" into a blank document so that I could cut them out and glue them onto the sucker. Position them so that you have at least an inch of paper before his head to allow for gluing and wrapping them onto the sucker. I also left enough room so that he could sign his name. 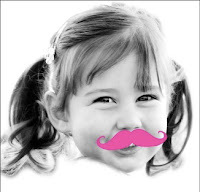 Step 5: Use a moustache stencil (Google them and you'll find a ton of different stencils) and trace onto a sheet of foam (sold near the felt at your craft store). Cut and poke a hole into the center with your scissors. Step 6: Poke your sucker through the center of the moustache and glue your tag onto them. Valentine's Day falls on a Tuesday this year, meaning Vaughn will be at school for it so guess I'll be making some for her too! Her 'stache is a bit wonky. Might need to take the time to fix it. Or not. They're kids and more interested in the candy. Valentine's Day will be here before I know it - better get moving!